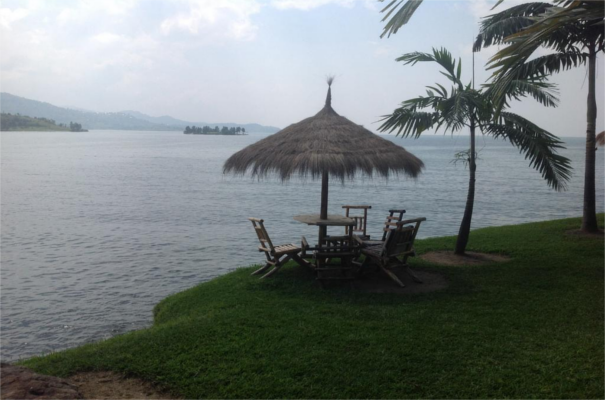 One of the great lakes of Africa, Lake Kivu lies on the border between the DRC and Rwanda in the Albertine Rift, part of the Great Rift Valley. Linked to Lake Tanganyika by the Ruzizi River the lake covers an area of 2700 sq km. The lake is particularly deep and experiences volcanic activity on a regular basis. The world's 10th largest island Idjwi, is found in Lake Kivu. The scenery is magnificent with the lake circled by misty, blue mountains. There are three known exploding lakes of which Kivu is one along with the Cameroonian Lake Nyos and Lake Monoun. This means the lake experiences violent overturns. The gaseous chemical composition is unique to each lake and in Lake Kivu's case results in methane and carbon dioxide due to the interaction between the lake water and a volcano. In layman's terms an overturn could result in an explosion which could obliterate most of the residents of the lake basin and create tsunamis to boot. Recent discoveries have indicated a huge reserve of methane gas beneath the lake floor which once exploited would provide enough energy to sell to Rwanda's neighbors as well as fuel its own industry. Fish species include barbus, clarias, haplochromis as well as Nile Tilapia, Limnothrissa miodon, which is one of two species of Tanganyika sardine introduced in 1959. The growth of the population of sardine has doubled the fishing industry and provided a rich source of protein for the Rwandans. Lake Kivu gained notoriety as the dumping ground for bodies from the Rwandan genocide and conflicts between the Hutu and Tutsi people.